This slim bangle from the Alyssum Collection is designed to easily slip on and off the wrist. 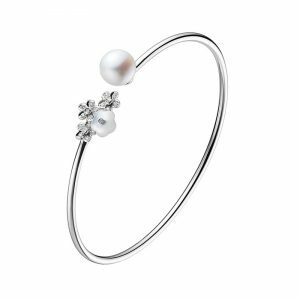 The simplistic design features a small cluster of 0.11ct diamond-set flowers, a flower shaped white mother of pearl and a 6mm freshwater pearl. 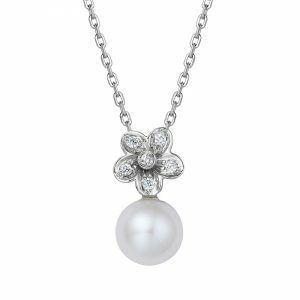 This lovely pendant from the Alyssum Collection is graceful enough to wear every day. 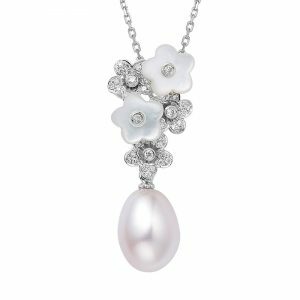 It features a 9-9.5mm round freshwater pearl set in clusters of 0.11ct diamond-set flowers and flower shaped white mother of pearls. Set in 18ct white gold and finished with a high polish. 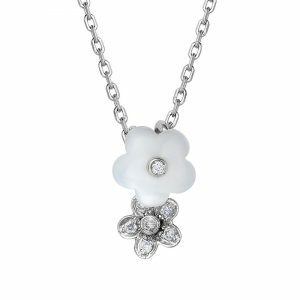 This effortlessly feminine necklace from the Alyssum Collection is delicate enough to wear every day. 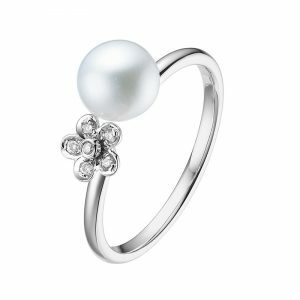 It features a 0.04ct diamond-set flower and a lustrous freshwater pearl, set in 18ct white gold and finished in a high polish. This effortlessly feminine necklace from the Alyssum Collection is delicate enough to wear every day. 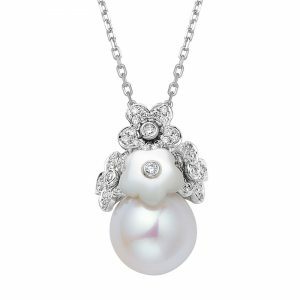 It features a flower shaped white mother of pearls and a 0.037ct diamond-set flower, set in 18ct white gold and finished with a high polish. 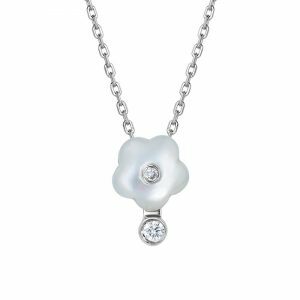 This effortlessly feminine pendant from the Alyssum Collection is delicate enough to wear every day. 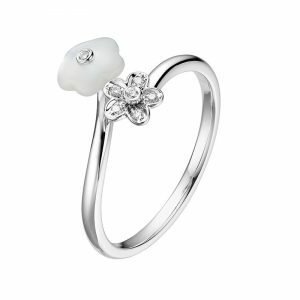 It features a flower shaped white mother of pearl and 0.023ct white diamonds, set in 18ct white gold and finished with a high polish. 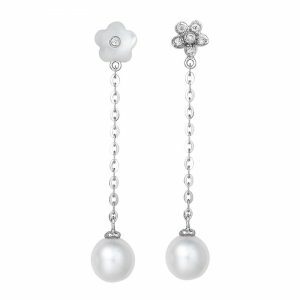 These drop earrings from Alyssum Collection are youthfulness personified with the asymmetric dainty floral motifs. 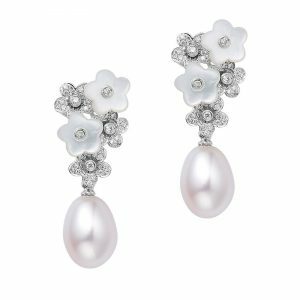 The drop earrings consist of a flower shaped white mother pearl and a 0.037ct diamond-set flower. 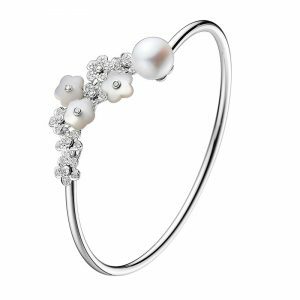 The 6mm freshwater pearl which suspend from the studs, gently sway from with the feminine movement. Set in 18ct white gold and finished with a high polish. These dainty stud earrings from Alyssum Collection are youthfulness personified with the asymmetric dainty floral motifs. 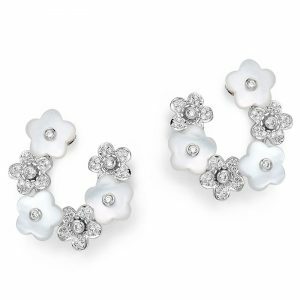 The stud earrings consist of a flower shaped white mother of pearl and a 0.037ct diamond-set flower, in 18ct gold and finished with a high polish. 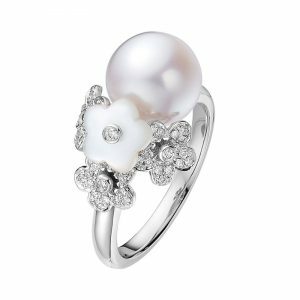 This ring from the Alyssum Collection is gorgeously floral design and features three 0.11ct diamond-set flowers and a flower shaped white mother of pearl, which cradles the lustrous 9-9.5mm freshwater pearl. Set in 18ct white gold and finished with a high polish. 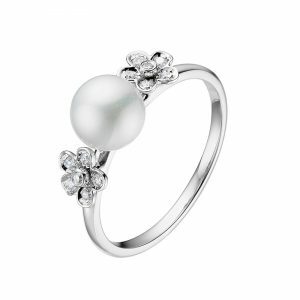 This ring from the Alyssum Collection is delicate and pretty with two charming 0.064ct diamond-set and a central 6mm freshwater pearl, set in 18ct white gold and finished with a high polish. 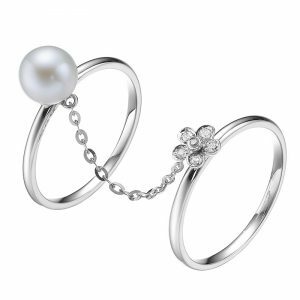 This chained ring from the Alyssum Collection is unique with coupling two rings featuring 0.033ct diamonds and a 6mm freshwater pearl, set in 18ct white gold and finished with a high polish. 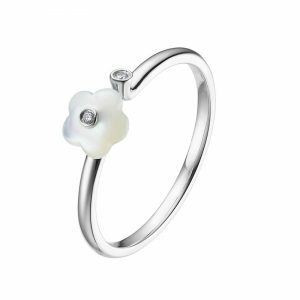 This open ring from the Alyssum Collection is graceful and features a flower shaped white mother of pearl and 0.013ct diamonds, set in 18ct white gold and finished with a high polish.